Then I needed to get busy with Camp Loopy Project #3. Tonight is the deadline. I only have a few more pattern repeats to be done.....wish me luck. Isn't that AWESOME!!!! It is a stick man knitting a sweater, and not just any sweater....a Longhorn Sweater! I love it! Thank you Margi and Rusty!!!!! Today, during lunch I taught another lady to knit.....her name is Suzi and she did a fantastic job. Here is the beginning of her scarf.....way to go Suzi! OK, I hope to post more later this week.....Happy Monday everyone! What a fantastic weekend!!!!! My LYS had the closing ceremonies party for the Ravellenic Games for Team Texas Yarnivore 2012! Tammy is the owner of Yarnivore is totally awesome! She had several prizes for each category. I entered 5 items. 3 in Work In Progress Wrestling, 1 in Sock Put and 1 in Cross Country....but I did not win a prize for those. However, Tammy had a grand prize where everyone's name was put in a hat and Tammy pulled out a name for this AWESOME Yarn made out of Pearl....yes, Pearl. It is for Vouge Knitting Magazine's 30th Anniversary and it is made by Yarn Sisters. Only 500 skeins were made. AND I WON IT! Yes, I won it! I was sooooooooooooooooooooooooooo excited! I cannot even tell you how excited I was. I hardly ever win anything (I am not kidding). So I was very surprised to win this. I think I will pet it for a little while, and then one day I may knit it into a wedding shawl for either me (if I ever get married again) or my daughter. It is numbered ( I have never owned anything that was numbered). I have number 261 of 500. I feel like I won a Lamborgini!!! The only bad news of the weekend.....remember the Pillow KAL I was doing with www.knitpurlhunter.com ? Well, I sent my submission in twice, and I never got a response. Well, I think my pictures were too big (boo hoo) and the winner was already announced. But that is OK, I won the Pearl Yarn and that was awesome enough. I made a pair of socks for my grandson.....but that little rascal is growing up so much, they do not fit. Do not worry! I will make another pair. This was entered into the "Sock Put" event...LOL! I also finished the test knit blanket. I entered this into the Cross Country event with my Ravellenics team (Team Texas Yarnivore 2012) and it was entered into Afghan Marathon on Ravelry. Last, but not least....I finished the Independence Pillow for a KAL. I entered this one into a contest to win a pair of addi interchangeable needles.....wish me luck!!!! Now....I have a scarf swap I am part of and the scarf I am making needs to be mailed to the recipient by September 1.....then I still have Camp Loopy #3 to work on...I have not even cast on yet.....it is due Aug 27th. Yes, I bit off more than I can chew, but is sure is yummy! I plan on casting on for Camp Loopy during lunch today! Hello....I had a wonderful surprise on my porch yesterday. I am a huge longhorn fan (University of Texas) and their main color is burnt orange....so most of the things I make are in a burnt orange or saffron or somewhere near that color. Many of my friends know that I love this color.....so this is what was on my porch yesterday! Yup! 10 beautiful skeins of perfect orange berroco ultra alpaca! YUMMY! Thank you BJ! Well, I go on vacation tomorrow....I cannot wait...only 3 days and 2 nights, but it is a much needed vacation! I am taking way too many projects with high hopes, so we will see how it goes. 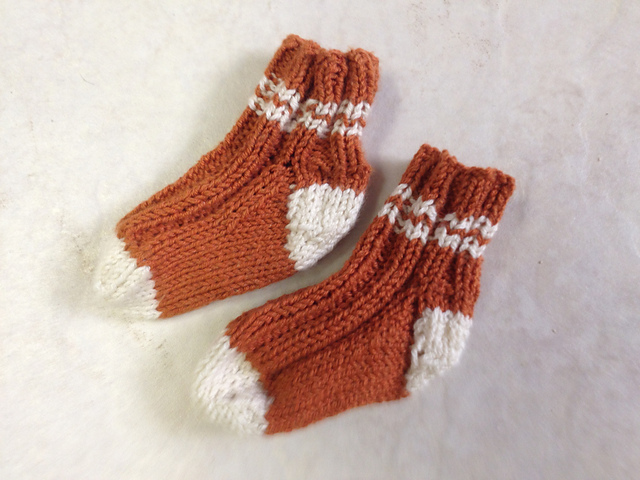 Lumberjack to make some socks for Antonio, my grandson, in burnt orange and off white. and just in case I get really ambitious....I am also taking the honey cowl. Here is a cute pic I found on Facebook....One day I WILL get a knitting related tatoo...I am just not sure what or where yet! Happy Wednesday everyone....I will probably not be back for a few days! WOW...it has been a week since I posted. I try to post more than once a week, but the week got away from me. My worthless renter finally moved out, and I have been pretty busy trying to get that house in order to re-rent. I hate to say that I have not been able to knit as much as I wanted to during these Ravellenic Games....boo, hoo! But....the good news is that I go on vacation in two days and I plan to do a lot of knitting while on vacation. I finished another Work In Progress. An Orange Sweater that I started in January of 2011. I also have been working on a WIP that I just started this year....it is a Kindle Fire Cover...I know it looks small, but trust me, it fits :) Yes, of course it is Orange! Then the test knit baby blanket has been giving me problems so it has been in time out, but I hope it comes out of time out soon, because the deadline is August 15th. And I finished the final part to the Pillow I am making for a KAL...now I just need to sew the seams together and put on the buttons....I am very excited and cannot wait to make another one of these. Now for sime side pictures...one is a couple of Longhorn Zipper bags my friend made....they are so cute and I LOVE THEM! Here is a picture of what I am working on ALL THE TIME....LOL!